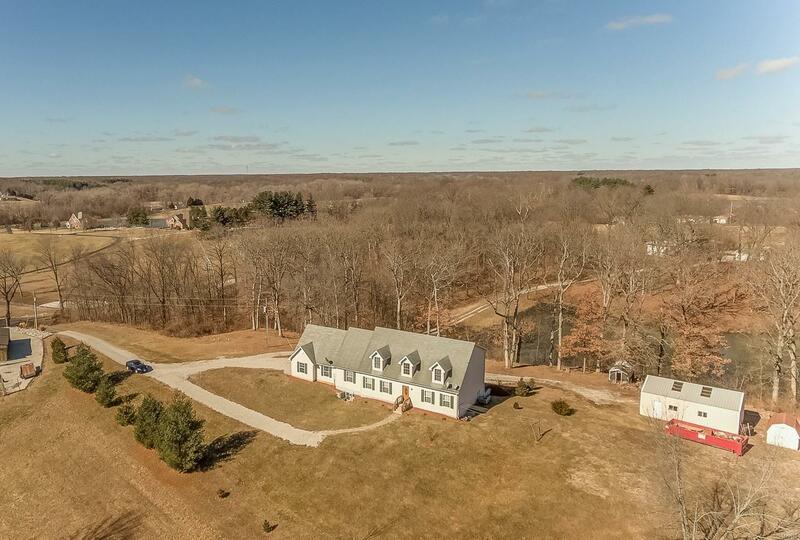 This 6 bed, 5 bath home on 9.5 acres is a dream! A grand 2 story entrance welcomes you to the main level freshly painted. New carpeting on main and upper level! Living & dining room open to the large kitchen offering natural sunlight, a gorgeous wood burning stove, & ample space to set up a family room area. The kitchens french doors lead to the deck overlooking the backyard & 1 acre lake. Main level laundry & master suite w/ new flooring features dual vanity, separate shower/jetted tub, & walk in closet. Upper level has a nice sized landing area & 3 bedrooms w/ large/walk in closets. Lower level would be an amazing family space or it's own separate apartment as it includes a full kitchen, dining area, living room, laundry-utility room, 2 bedrooms & 1 1/2 bathrooms. A 2 car garage, carport, barn shed, chicken coupe, & wood storage could all be yours. 1 year warranty included! Each driveway has separate entrance - no driveways are shared. This home has numerous features & is a must see!